UNICEF Ambassador Clay Aiken is continuing his work to promote support for the children of Somalia, following his recent trip to the northwestern region of Somaliland. In a blog entitled Somalia: Keep spreading the word, Aiken thanks donors for raising $50,000 for Somalia's children in the last six days, and challenges UNICEF supporters to take action in advocating for children. UNICEF is one of the few humanitarian organizations with an active presence in the war-torn country, acting as a vital lifeline for the innocent victims of war. In a previous blog, Aiken described his visit to UNICEF-supported schools and hospitals, centers where girls learn leadership, life-skills and play sports, and UNICEF-supported maternal and child health clinics that offer nutritional feeding and immunization, programs that save lives and improve the quality of living. UNICEF has been helping children for over 60 years and has saved more children’s lives than any other organization in the world. We have the history and the experience to overcome obstacles like politics and poverty—even war—which can stand in the way of helping a child survive. While we could never do it alone, we are often the ones who reach children in need after everyone else has given up. By supporting UNICEF's programs, you can do something to make a difference. What does it take to save a child? $1.20, a little more than the price of downloading another song to your iPod, can immunize a woman and her newborn against tetanus. $17, less than the price of a takeout pizza, can immunize a child against the six major childhood diseases. $60, the price of the Grand Theft Auto video game, can provide enough vaccine to immunize 60 children against polio. $200, the price for a mediocre ticket to a playoff game, can buy a large cold box for the transportation of vaccines to remote locations. What will you do to save a child? There are three simple things anyone can do to be a part of the solution: ask your family and friends to become involved; encourage them to become informed about UNICEF's work in Somalia, and; ask them to donate to support child survival programs in Somalia. And remember: education is the key to ending the cycle. $3 can provide a child with a pencil, paper pad and a pen to use in the classroom. $16 can buy a double-sided chalkboard for classroom or outdoor use. $176 can buy one school-in-a-box kit—a ready-made educational solution packed in a lockable metal box, containing equipment for 80 students such as pencils, erasers, exercise books, writing slates, scissors and carrier bags. Act now to save a life and together, one by one, we can save the world entire. 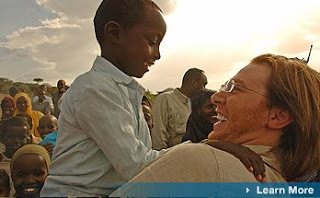 Clay Aiken laughs with children he met on a UNICEF field visit to northwest Somalia. 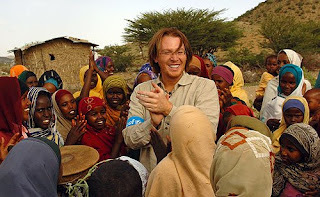 UNICEF Ambassador Clay Aiken has blogged about his recent visit to Somalia in a UNICEF FieldNote entitled "Where is the outrage?" Somalia, a country of ten million located in the Horn of Africa, has been torn asunder by civil war for seventeen years. With no central government and few safe havens for those caught up in the conflict, it has been completely destabilized. Children, the most vulnerable, are among those most affected by these conditions. Is that reason enough to be outraged? ...the lack of a permanent central government has contributed to Somalia's status as one of the poorest and most volatile countries in the world. Decades of civil conflict have shattered social structures and exacerbated poverty. In such conditions—combined with an extremely arid environment and difficult terrain with settlements scattered over vast distances—a Somali child's chances of surviving to adulthood are among the lowest of children anywhere in the world. One in every eight children do not survive to their fifth birthday, one of the highest rates of death among children in the world. Nearly all of these conditions are preventable with sources of safe water, proper hygiene and improved nutrition, as well as medicines and vaccines that are readily available in the western world. Yet people, especially children, continue to die. Somaliland, the region of the country Aiken visited, is relatively safe when compared to the utter chaos that reigns throughout most of the country, and it is there where the success of UNICEF programs is most apparent. Aiken describes his visit to UNICEF-supported schools and hospitals, centers where girls learn leadership, life-skills and play sports, and UNICEF-supported maternal and child health clinics that offer nutritional feeding and immunization. These programs save lives. Is that reason enough to turn outrage into action? Go to the US Fund for UNICEF and read Clay Aiken's Somalia blog, "Where is the outrage?" Then DONATE to support UNICEF's child survival programs in Somalia. These UNICEF programs have been proven to be effective. They need to be supported and children need to survive while the monumental task of bringing peace to Somalia continues. If the children don't survive, what future does Somalia have? Every day, 26,000 children die of preventable causes. Now you have a chance to help save them. The special global broadcast will feature UNICEF at work to protect and support children, highlighting projects in Laos, Iraq, Ethiopia and Peru. 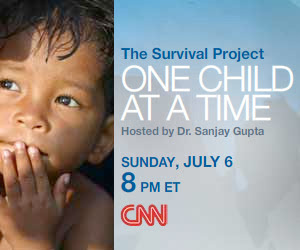 Dr. Sanjay Gupta, CNN's chief medical correspondent, will host the program, which will explore “the challenges faced by children around the world and will offer viewers an opportunity to effect helpful change,” according to Sue Bunda, Executive Vice President of Content Development and Strategy for CNN Worldwide. UNICEF Goodwill Ambassadors Lucy Liu, Clay Aiken and Marcus Samuelsson will take part in the program. Clay Aiken, singer and entertainer, is a proponent for education for all. He is seen here on a recent trip to Somalia. Lucy Liu, actress and artist, is shown with children in Pakistan. She supports HIV/AIDS awareness and education programs. 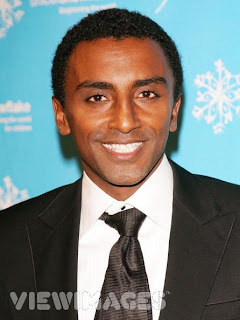 Marcus Samuelsson, gourmet chef, is spokesman for the TAP Project, helping to make clean water available for all. Celebrity volunteers appearing will be Joel Madden, Nicole Richie, and Al Roker. Video diaries of several UNICEF ambassadors and celebrity volunteers will air, showing their work in the field and encouraging viewers to join the fight for child survival. In addition to field reports from CNN correspondents, the broadcast includes a panel of volunteers and experts speaking about their experiences with UNICEF. UNICEF has been helping children for over 60 years and has saved more children’s lives than any other organization in the world, helping to reduce child mortality to a record low by providing lifesaving help for children in need. UNICEF is in the field, every moment of every day, working for children. Tune in to see how you can make a difference for children. Every one of us can do something to help save the life of a child. CNN Chief Medical Correspondent Dr. Sanjay Gupta, with children in Lima, Peru. Aiken visited Hargeisa, Gabiley and Boroma in the northwest to witness UNICEF-supported projects in action, including programs to improve children's health, provide safe water, sanitation and hygiene, make primary education available to all, protect children and empower girls. In a country that’s better known for conflict, insecurity, drought and floods,it’s truly remarkable that UNICEF is still able to make a difference to the health, education and well-being of Somali children. In Somalia, less than twenty-five percent of the population has access to basic health services and under thirty percent of children receive a primary education --- a particular concern for Aiken, a former teacher. The country has been torn by war for nearly two decades. Due to this civil unrest, there is little effective infrastructure, and children face malnutrition, threats to health including polio and cholera, a lack of education, and random violence, among other catastrophic circumstances. Despite threats of violence to humanitarian workers, UNICEF remains in the country, responding to these acute needs. This is Aiken's second trip to the African continent for UNICEF. In 2005, he visited Uganda to observe programs for children who have been forced to flee their homes to avoid abduction by rebel forces, and spoke with former child soldiers who are being reintegrated into Ugandan society. He has also visited Indonesia following the tsumani, observed education programs in post-Taliban Afghanistan and spent Christmas with flood victims following last winter's storms in Mexico. Somali families want the best for their children and people really want to help bring about change. Fortunately, UNICEF has always been there and continues to provide the support needed to make a difference. This blog will carry further information on Aiken's trip, along with information on fundraisers to assist the children of Somalia, as details develop. To find out more about helping the world's children, visit US Fund for UNICEF.